These Safco Aluminum Blueprint Clamps are 30 inches long each and are sold by the carton only. Includes 6 clamps per carton. 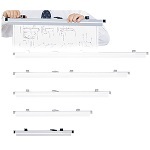 These Safco Hanging Clamps are fully compatible with all other Manufacturer's Drawing Racks and Stands. Each clamp is constructed of extruded aluminum with polished chrome-plated cast alloy wing knobs. Print-Lock variable tension metal mounting clips are user friendly and will not stick or jam when inserting or removing projects. The wing knobs are guaranteed for life, and the entire clamp is warranted by the factory for 10 years. All Print-Lock clamps will hold 100 sheets or 20 pounds and come with "eye-ease" green color plastic label holders. 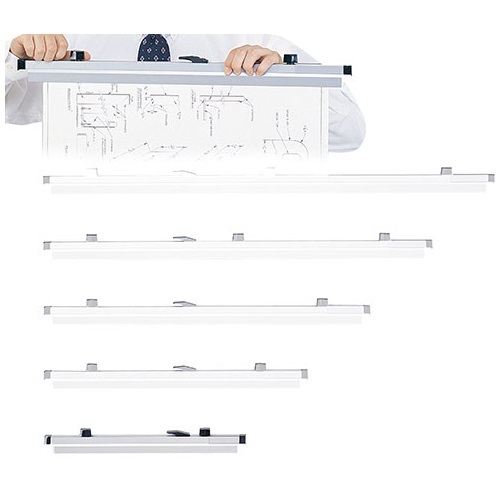 Dimensions are 30" (30" is the part that actually touches your drawing and does the clamping). The clamp is 31-3/4" overall length tip to tip.